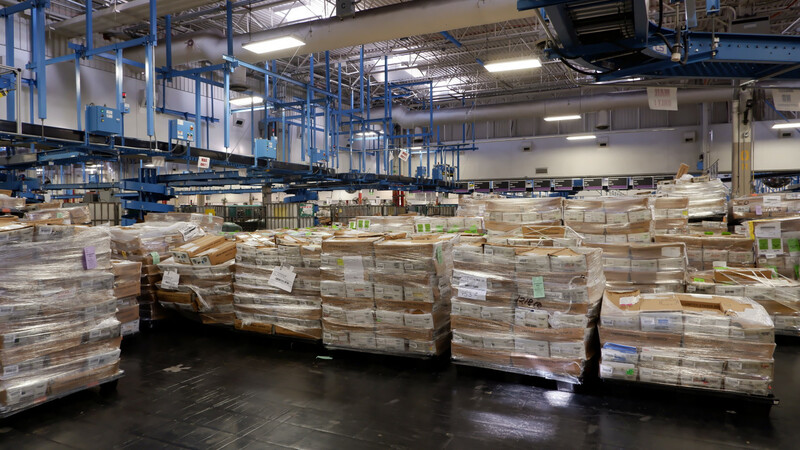 Inside of a northeast Denver building spanning roughly seven football fields, the journey begins for about two-thirds of the more than 3 million ballots that will be mailed to voters ahead of the Nov. 6 election. It’s here that the U.S. Postal Service plays its vital role in Colorado’s all-mail-in elections. The building was roiling with activity Monday morning as workers began working their way through a sea of pallets carrying the longer-than-usual ballots — thanks to so many questions for voters — that must be distributed across the state. But more than you might think goes into getting all of those ballots to their destinations. The Postal Service works with Colorado’s county clerks for months in advance of elections to make sure the ballots are perfectly sized, printed and packaged. Something as minor as a misprinted barcode could spell chaos for the finely tuned dance that is ballot distribution. If ballots are the wrong size, the machines that sort them at a rate of 40,000 pieces an hour could be held up. The Postal Service has even created a position to manage the wave of ballots: a Colorado election coordinator. That’s Donna Walker’s job. She was making her way through the Denver Processing and Distribution Center north of Interstate 270 near the Commerce City border on Monday, keeping tabs on the carts and pallets zooming around to sorting stations. “Crunch time, it can be a little chaotic,” she joked. Colorado is one of three states that mail ballots to every voter thanks to a bill passed by the legislature in 2013. The others are Washington and Oregon. About 2.1 million ballots are expected to pass through the center alone over the next few days. About 400,000 of those are for Denver County voters. First, county clerks check their rolls with the Colorado Department of Corrections and Colorado Department of Public Health and Environment to make sure no voters have died or been imprisoned on a felony charge. County clerks contract for ballot printing. Finally, the documents make their way to the Denver mail processing plant where they are fed into machines and sorted by ZIP code for delivery. Typically the sprawling facility deals with about 9 million pieces of mail a day, so a few million more ballots don’t lead to pandemonium. “It’s just that pace gets a higher tempo,” said Rogers Pierre, a mechanic at the Denver Processing and Distribution Center as he monitored a machine about to process ballots. Each county must pay the Postal Service to mail its ballots out to voters. Denver is doling about $675,000 this year between postage and printing costs. Voters cover the cost of postage to get their ballots back to their county clerk’s office. For this year’s general election, Denver’s ballot required 71 cents for postage, for instance. The USPS and Denver elections officials will do a final sweep of Denver Processing and Distribution Center on election night to try and snag any straggler ballots that people might send in late. It’s an 11th-hour effort as part of the Postal Service’s broader commitment to ensure the state’s mail-in election process doesn’t confuse or disenfranchise voters. “We’re right up to the last second,” Rupert said. Be the first to comment on "From A to Z With an Emphasis on USPS: An Inside Look at Colorado’s Ballot Delivery Process"